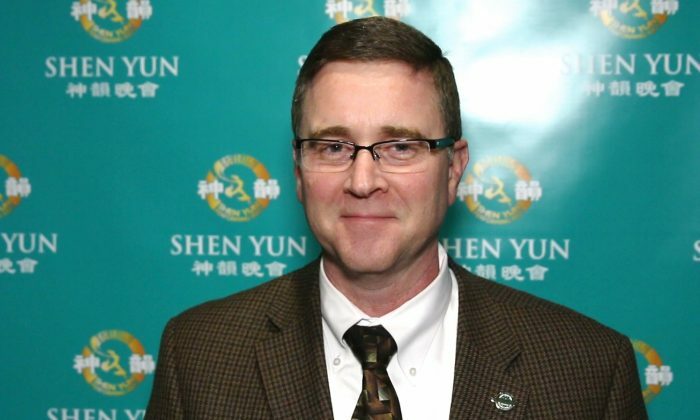 INDIANAPOLIS—The beauty of Shen Yun Performing Arts struck Mayor Mark Myers of Greenwood City, when he saw the company stage the first of three performances in Indiana. “It was very beautiful … To see the dancers and to see their passion and their love for the art and to tell their story of how China used to be, was a very beautiful experience,” he said after seeing Shen Yun at Clowes Memorial Hall of Butler University, Jan. 16. “It’s a very unique, very beautiful experience,” he said. Mr. Myers is serving his first term as mayor of Greenwood, a city with just under 54,000 residents that lies on the southern outskirts of Indianapolis. Shen Yun is a classical Chinese dance company founded in New York in 2006 with the mission to revive China’s traditional culture through the performing arts. Classical Chinese dance is a highly expressive dance form that was originally very close to martial arts. Over thousands of years, as it steeped in the cultures of China’s different dynasties, it evolved into one of the most comprehensive dance systems in the world. In addition to classical Chinese dance, Shen Yun also performs ethnic and folk dances from China’s distinctive ethnic minorities and regions. Mayor Myers particularly enjoyed the costumes, choreography, and feeling of the dancers in a Tibetan piece, Snow-Capped Celebration, in which male dancers leap and jump in joyful celebration beneath a grand palace high in the Himalayas. “When the dancers came out and their outfits were so well done, and the choreography was done so that they actually looked like mountains, they blended in with the mountains. You could tell there was a lot of really hard work and deep passion that went into that. It was a very beautiful dance,” he said. The music of Shen Yun is another unique feature with all-original scores played by a live orchestra that combines both classical Western and traditional Chinese instruments. This year’s performance in Clowes Hall also included a solo on a traditional two-stringed instrument called the erhu, and two vocal soloists who performed genuine bel canto technique. Mr. Myers said he found the erhu “very beautiful, very touching, very pleasant to hear, and very calming,” and that the spiritual themes in the lyrics of the vocal solos really touched him. To see their faith and their passion in that is very beautiful, because that’s what it’s all about. “To see their faith and their passion in that is very beautiful, because that’s what it’s all about,” he said. He said he would recommend that everyone see Shen Yun. “It’s really an encouraging thing to come see. It’s a new thing to come see and I encourage people to want come see this,” he said.